Do you ever feel like you hit the ground running and never stop from the moment you roll out of bed in the morning until the moment you fall back in at night? Me too. And I haven't even done the dinner dishes yet. Joel and I are making a concerted effort to be more present for our children. There are always so many distractions. So many. And sometimes I think our kids suffer for it. After school is an especially difficult time for me. I'm already so tired from the day, and then pure craziness ensues. I'm only one person and they are all vying for my time and attention for those 4 hours or so before bedtime. It's absolute chaos, and I think that homework and practicing and whatever else needs to be done usually gets done rather haphazardly. So, I'm trying to change. And in order to do that I have to eliminate all of my distractions during that time. That means all of my own chores must be done before 3:21 pm every day. The computer can't be on during those after school hours, and I have to stay present. I have to help with scales and spelling and note-reading and long division and music technique and keep Sophia happy all at the same time. But it's working. We're being more effective. Let's hope it sticks. In other news, I was tagged to do a meme by Rae of Lulu. Since I feel like I am fresh out of great stuff (or even not-so-great stuff) to say, here is the tenth picture in the first folder of "My Pictures" on this computer. Which is not my computer, be aware. This is Joel's laptop, and I am currently being lazy (ignoring the dishes and everything) and lounging on the couch as I blog. So this is it. 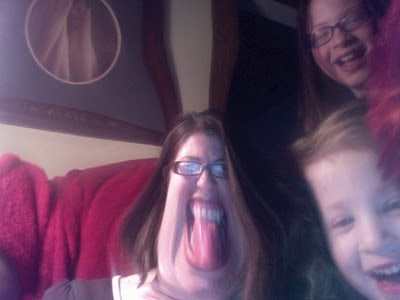 The girls and I were having fun with Photo Booth a few weeks ago. By the way, that's Chloe. I'm thinking it's pretty hard to tell. And, since we've started, we may as well finish. I must say, this picture makes me feel 78% better about my current state of inability to lose weight no matter what I don't eat. I remind myself of Harry Potter's Aunt Marge! Things could certainly be a lot worse. And I'll definitely be leaving Photo Booth alone for a while. I have never tried this program. And now, I am grateful. 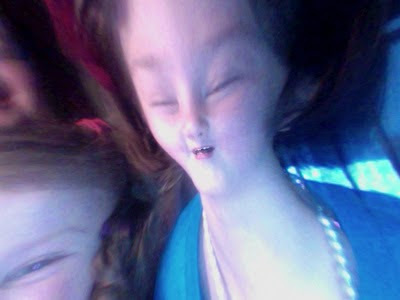 My kids love Photo Booth. Zoie loves turning on the video option. I often find interesting interviews or stories (and wacky photos) when I get on the computer. Good luck with your new schedule. I need to do that. It's Spring Break and I've been lazy all week. LOVE the pics ... we have a little too much fun with that, also! And I am very motivated now to set some specific after school standards - great things to just have it in black and white and make it happen. Great idea - and I love your jello post below - made me laugh - I am really into Jello and could appreciate that battle! The kids and I sit down for an hour after school at the dining room table and have "study time". I have a snack ready and play nice soft music and we sit together and do homework and read, or whatever else can be done there, all together. Then they can go play for an hour or so and come back in time for dinner. We do practicing before school. well i have no suggestions since my little buttons are 5 and 7 months - but i am paying close attention to whatever you are doing! and you are doing a great job from the looks of things. i don't know how i will muster up the energy to do all that when i can't seem to manage to clean my house anymore since the babies came. i feel exhausted all the time!- and the photos are hillarious. Love your new header! 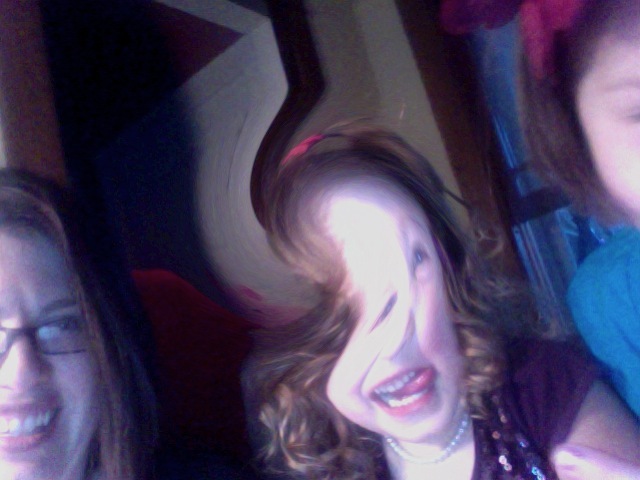 And Photobooth is one of our fave pastimes, too. Although our newest one (starting tomorrow) will be puppy training. You guys are funny!!!!!! And look at those girls wearing pearls to bed!! Such girls!1 LOVE it! Oh, I've felt that running thing lately. I had a few hours to myself tonight and it felt really hard to focus after all the chaos. What fun pictures! You guys laugh and smile a lot. That's such a gift. Those photos are way too funny! I am dying of laughter as we speak. It sounds like you are doing great at keeping your day organized. Just keep doing what your doing. You are Great! Our very best days are when we do like Kazzy suggests: sit down to snack and do homework together as soon as they get home, otherwise things spin out of control really quickly and we somehow end up doing homework right before bed, which I HATE. Yeah. Grateful to be the size you are when you look at that, eh? (not that I think you're not a good size, just empathizing with the wishing you were a different one! :))You should also be grateful your kids don't look like that, either. Of course you'd still love them if they DID, but. . . Such fun and wonderful memories with the girls. I am sure when you pull these up in the future, when they have boyfriends, it will be one of the funnest times of their lives. Give yourself a break and please realize that just being available to your girls is the greatest gift you can give them. They will remember that mom and dad were always there to help with whatever they needed whenever they need. You are blessed! So somedays just sit back and really enjoy the blessing and quit stressing about getting it all perfect. You are doing an amazing job. Your kids are so cute. If I showed this to my kids, they'd have a hayday. I find it increasingly hard to balance everything with the kids, and my work, and the house. Especially now that my kids are getting older, and it seems their activities are starting to conflict with each other, and I'm trying to figure out how to be at three places at once while my husband works late. I've learned to accept that my house will rarely be clean, and I'm okay with that. Oooo ... the dreaded arsenic hours. The after school mayhem! The agony! I'm with you on getting YOUR 'chores' done before they get home. It also helps to have dinner made (though I'm not at all good at that - I have a thing about cooking before 4pm.) Can you do practicing in the morning, maybe? I do hope you have your kids doing chores, too. I'm serious. You help them, they help you. Emptying the dishwasher, putting away folded laundry, making their own beds - these are ways to stay on top of "your" chores. And I have found that if the t.v. stays off, things stay manageable. It didn't sound like that was a problem for you, so no worries. And you aren't too far away from the time when your older kids can help the younger ones with their music stuff or homework. Let them. They're wired for it. And above all, GO TO BED. No matter what. Choose a bed time for yourself that is non-negotiable. That means you leave dishes in the sink, laundry unfolded, etc., and you SLEEP. We get so much more accomplished when we're rested. You're an awesome mom, Lara. Oh yes, I hear you. I mean, mine don't even go to school yet, and those witching hours are still HARD. Can't imagine. And the pics...oh my funny. That photo does look like Aunt Marge! Oh, you've made me laugh. HA! 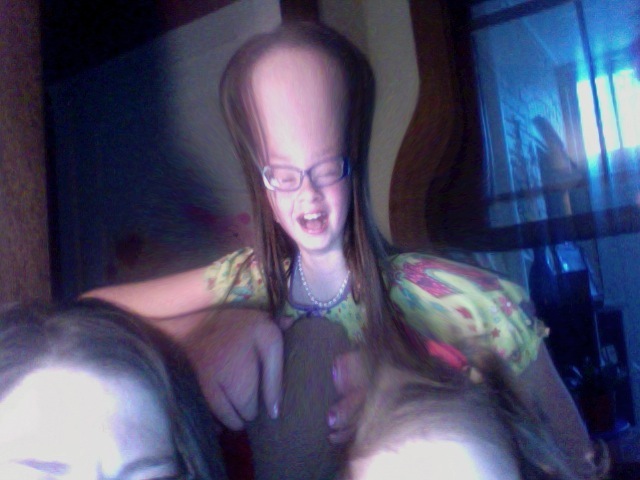 I love Photo Booth! Your picture kind of makes you look like Slimer from the Ghostbusters! Which of course made my day...maybe you should Photoshop yourself green!